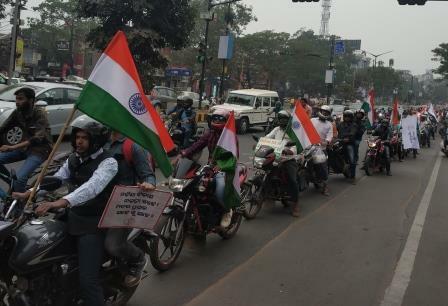 Bhubaneswar: The Mada Mukti Yuva Bahini (MMYB) on Sunday organised a bike rally in the Odisha capital demanding total prohibition in the state. It also gave a memorandum to Excise Minister Sahsi Bhusan Behera demanding to announce and implement anti liquor act before the election code of conduct comes into effect. It warned that MMYB would campaign against the Excise Minister in his constituency in the ensuing assembly election. To mark and celebrate the 1st anniversary of its formation Mada Mukti Yuva Bahini, it organized this bike rally. More than two hundred of its volunteers from across the state participated in the bike rally. Satyabrata Prusty, Convenor, MMYB said liquor is destroying thousands of families in villages across the state. “The state government’s claim that it gets revenue from it is absolutely false. Rather, it is loosing revenues manifold. This government is shamelessly increasing liquor shops every year. This has shaken off the financial and social backbone of Odisha,” said Prusty.